Is Thanksgiving one of your favorite holidays? It’s definitely one of mine. When else is it OK to pile food on our plates and stuff ourselves until we can’t move? Thanksgiving is one week from today. To simplify entertaining, here are 9 sure-fire tips to get organized and be prepared, starting a day or more in advance. Most importantly, enjoy your guests and the meal! Don’t spend all your time in the kitchen. You don’t have to do everything yourself. If it’s acceptable in your circle, ask guests to bring a simple dish or dessert to share. If it’s not, buy some prepared dishes. A day or two ahead, speed clean the public areas of your home. In each room, set a timer for 15 minutes. Clear visible clutter and do a quick vacuuming and dusting. Make notes for the big day. Things tend to get hectic as guests arrive. Refer to your notes and you’ll stay on track. Finalize what you plan to serve. Prepare the grocery list according to your store’s layout and shop two to three days ahead. Set the table with a festive centerpiece a day or two in advance. Plan where guests will sit. This close to the recent election, you don’t want cousin Amy, an inconsolable Hillary Clinton supporter, sitting next to or across from cousin Adam, a blowhard Trump supporter. As the hostess, plan safe, guest-friendly topics to discuss. If your group rarely gets together, this is a perfect opportunity to catch up with one another. Encourage funny stories! For a special touch, under each guest’s plate put a brief note stating why you’re thankful to have him or her in your life. The surprise will come as the plates are cleared from the table. I’m thankful for you, my loyal subscribers who enjoy reading what I’ve had to say (and perhaps implemented some of my tips) over the past 12 years, clients who let me do what I love every day, prospects I hope, one day, will allow me to help them organize, simplify and improve their lives, and, of course, family and friends.I hope your Thanksgiving is filled with cherished family and friends, great food, good cheer and delightful conversation! 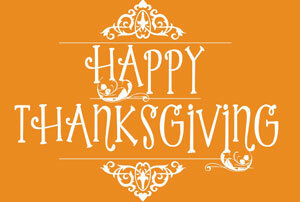 Have a happy, organized Thanksgiving! previous post: Shocking News: Does YOUR Surge Protector Protect You? next post: Make 2017 YOUR Year To Get Organized-FOR GOOD!